Gear made in the seventies is some of the best stuff ever made. It was built to last, as evidenced by the fact that a good amount of ’70s equipment is still in use today. By the time the 1970s had rolled around, instrument manufacturers were at the top of their game, quality-wise. Another great thing about 1970s gear is that it came before the age of electronics, so the sounds are smooth and warm. Tubes are great in everything, especially amps and compressors. That’s why most great seventies albums are so intimate sounding, as opposed to the clinical, sometimes-too-perfect sounds of the ’80s. The classic guitars from the sixties, like the Fender Strat and the Gibson Les Paul came right on through the seventies. Manufacturers still experimented a bit now and then. For example, the Peter Frampton talk box effect was extremely popular in 1975 due to his song “Show Me The Way” which was hugely successful that year. Synthesizers were finally making their appearance in music. 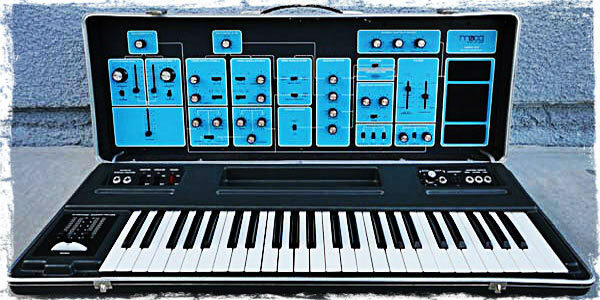 In order to achieve a new modern sound, sixties artists adopted synthesizers in the ’70s. Although many of the synths were in the early 1970s were monophonic and somewhat crude, artists were finding all sorts of creative ways to use them. By the end of the decade synthesizers, like video games, had evolved immensely. Drum sets, which had grown quite a bit in size in the ’60s, continued to increase in piece size. Twenty years ago a pop/rock drummer might need a 3- or 4-piece maximum set, but by 1979 it was normal to see a drummer with anywhere from 6-12 pieces. Also hand drums and other Caribbean percussion instruments were very popular in the 1970s. Led Zeppelin drummer John Bonham brought back the gong. Jethro Tull front man Ian Anderson kindled a renewed interest in the flute as well. Musicians were trying new instruments from all around the world. We will be profiling dozens of great seventies instruments in the coming weeks, but it will take some time. The profiles will appear below. In the 1970s, all synthesizers were analog: that fat, warm, vintage sound. Here we list nearly every synth ever made in the '70s. Pics and more.